Which is the best wooden fence material? What is the longest lasting, best looking, most affordable wood fence material? 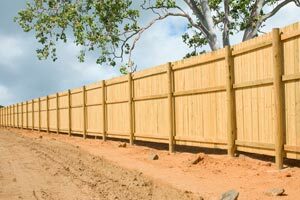 We have the pros and cons of cedar wood fencing vs pressure treated pine fences. Here is some very useful information about western red cedar and pressure treated pine, the two species of wood used to build fences in our area. FOR THE LONGEST LASTING, BEST LOOKING FENCE, WE RECOMMEND USING PRESSURE TREATED PINE FOR THE POSTS, AND CEDAR FOR THE REST OF THE FENCE! Red Cedar: Red cedar wood fence is a great option for privacy wooden fences that do not touch the ground. Cedar is a stable wood fence material, that does not warp, shrink or check. 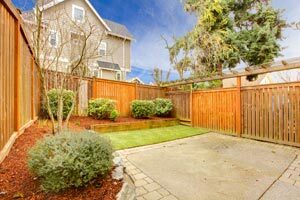 Cedar wood fences tend to last longer than pressure treated pine board fences. Cedar could last 30 years or more and will stay straight! Pressure Treated Pine: Southern yellow pine is a fast growing species that is kiln-dried, pressure treated to remove most of the moisture. This pressure treated pine is guaranteed by the manufacturer not to decay or have insect damage for 20 years or more. It is not guaranteed against shrinkage, warping, or checking (splitting). Cedar is a softwood, but that doesn’t mean it isn’t durable. In fact, it is one of the most durable types of wood having a lifespan of more than 30 years, even when left untreated. The wood is naturally resistant to decay and insects. Cedar is also prized for its attractive appearance. Red cedar, as its name implies, has a deep mahogany color and fine grain. The primary con of cedar is that it is expensive compared to many other fencing materials. In general, the more durable and attractive the wood, the more it will cost. Cedar is also not a good choice if you want to paint the fence, as the color is strong. It will take several coats of paint to cover it up. Finally, some people do not care for the scent of cedar. To those who aren’t allergic to the scent, however, the fragrance may be a positive. Pressure treated pine fence is the most popular residential fence choice in outdoor structures such as: decks, porches, and all types of residential fences, for example. Pine wood fencing is very cost effective for private home or commercial privacy fences. Pressure treated pine fencing is easily stained to a variety of colors.